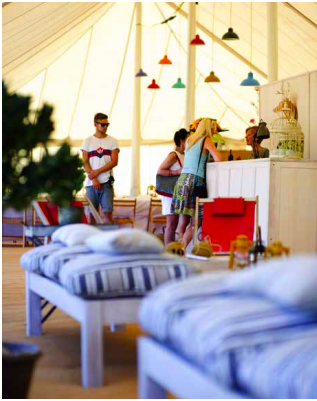 Yurtel provides a place to recover, recharge and get ready for your next foray into experiencing the festival. Stay with Yurtel @ Steanbow and rest assured that all you need to focus on is having the time of your life whilst we take care of the details. You only need climb into a Yurtel shuttle to be whisked back to camp in minutes for some wonderful peace, quiet and dedicated pampering. In addition, our RVP (Rendezvous Point) gives you the peace of mind that you have an easy and central point (approx 100m from the Pyramid Stage) at which to regroup with your friends and family before striking out for the next never-to-be-forgotten adventure. A short transfer takes you back to camp where you will be treated to delicious and sustaining menus designed by one of the UK’s hottest chefs Jasmine Hemsley, the finest of refreshments in the tranquil Bar & Lounge, take it to the next level with first-rate treatments in our Private Spa. Get your day off to the best possible start with the renowned Yurtel breakfast - included in the price of your stay. From fresh fruits & granola to a selection of nutritious and energising hot dishes, including Yurtel’s signature chorizo, potato & poached egg hash and Jasmine’s Chestnut crepes with vanilla chai plum compote, there’s no better way to revive, refresh and reboot. As the sun sets or rises, relax and regroup with a cocktail in our Spa Bar (new for 2019) which enjoys panoramic views from the Festival to Glastonbury Tor, before dining in style in the a la carte restaurant. What better way to set yourselves up for another helping of Festival delights? The finest service and accommodation in the ideal location combined with our private shuttle into the Festival will all help make Glastonbury 2019 one that you will never forget. "This is the only way to do Glasto: The staff and everyone involved were terrific, thank you." "Yurtel did a fab job. The staff were great and staying here for Glasto is the best choice"
Chauffeur transfers into the festival. Rendezvous Point (RVP) close to the festival hospitality area. We have commissioned one of the UK’s hottest chefs, Jasmine Hemsley to design the menus for Yurtel @ Steanbow 2019. Based on the ancient philosophy of Ayurveda, the focus is on delicious food designed to comfort, nourish and invigorate, and is naturally gluten-free. Whether gearing up for the day ahead, taking time out for a quick recharge or fortifying yourself for the big night out, we have all bases covered. A good start to the day is central to getting the most out of your Glastonbury, so we lay on a n amazing delicious breakfast spread (included in all accommodation packages). From 8 till 12 noon you will be able to treat yourselves from the buffet selection of hot and cold deliciousness. From fresh fruits, baked goods and our housemade granola, to locally smoked salmon with sourdough & cream cheese, classic bacon and eggs (again locally sourced of course) and vegan drop scones with spiced rhubarb, we endeavour to cater to all tastes and dietary preferences*. For something East by West, try Teff waffles with turmeric and honey drizzle, or tuck into Sunny-side-up eggs with flax crunch and tomato chutney. * Please note that these are sample dishes and may be subject to change. From noon through to 6pm, guests can choose from our grazing menu; Middle Eastern mezze, Somerset Charcuterie platters and deliciously wholesome salads crafted from nutritious, organic ingredients. Keep your digestion fired up with dishes designed to keep you going without sending you off for a siesta! Slices of fresh chickpea-based, gluten-free Pizza Pudas served with your choice of Dosha specific salads to balance you out or tuck into a hearty Rasta dal with coconut lentils. If you’re on the go grab a Rose and cardamom-scented ladoo - the original energy ball, that will keep safely in your pocket for when hunger strikes. offerings that will help you push on late into the night. Dine on classic steak, market fresh fish or hit pure comfort with Spiced mince and gravy on swede mash with broccoli trees, Lemon, turmeric and black-pepper salmon with seasonal braised veggies, Quinoa minestrone with Rosemary mung bean bread or Chicken soup for the soul with gram flour dumplings. All of our food is created in our field kitchen from scratch using the finest ingredients. We source as much as possible from local suppliers and producers. The menu often evolves over the course of the event to make the most of the freshest ingredients available. We put as much care and attention into our bar list as we do into the rest of our menus, which feature a refined list of cocktails and fine wines backed up by the best premium spirits, locally brewed beers and, Somerset ciders. Not to mention our range of non-alcoholic drinks packed with revitalising goodness. Of course, no self-respecting bar would ever be without a selection of award-winning Champagne and British sparkling wines. We source and install the best luxury loos and showers on the market. Our dedicated team ensure they are all kept in tip-top condition 24hrs a day, throughout the weekend. Alongside these sparklingly clean facilities sits our Bouffantery featuring all of the tools required to help you primp, preen and ensure you look your beautiful best for the fun ahead. Our resident Yurtel Glamour Technicians will also be on hand offering services such as ladies' and gents' cuts & styling, masterful makeup and the application of festival glitz and glamour. More details and information on how to book will be released in the run-up to the event. With significant new investment, the 2019 Spa will be even better than previous years. Enjoy Après-Festival in decadent relaxation, sipping cocktails from our Spa Bar in wood-fired hot tubs, featuring views from the Festival to the famous Glastonbury Tor. Let our talented therapists relax you into the weekend or sooth those tired dancing legs before heading back to the real world with one (or more!) of the fantastic treatments on the spa menu. Booking will open before the event so you can reserve a spot before you arrive on site. The Bar & Lounge is the perfect place to ease into the day with the papers and a Bloody Mary - or a lip-smacking cocktail or two prepared by our talented barkeeps. Lounge in a deckchair on The Lawn whilst sipping ice cold rosé as you plan your day’s entertainment or relax by the fire bowls with friends late into the night. This years’ Yurtel soundtracks are being mixed by the irreverent 6Music Breakfast DJ Shaun Keaveny– featuring some stand-out Glastonbury performances as well as some legendary tracks that will be available on Spotify. Your favourite act is playing in 20 minutes? No problem! Simply hop into one of our shuttle vehicles and be whisked into the Festival in comfort and privacy. The shuttles run 24 hours a day from the camp to our on-site drop-off point and back again. Our Rendezvous Point (RVP) is located around 100m from the Pyramid stage and is adjacent to the Festival Hospitality area. The RVP is staffed 24hrs a day so you are always guaranteed a friendly face and smooth transfer back to camp. Be it our bespoke travel service (helicopter & chauffeur planning) to our local knowledge - we will do our utmost to ensure you arrive at our private secure parking area as quickly and as smoothly as possible. Our porters will then load your luggage onto the Yurtel buggy and whisk you to our reception tent where we’ll furnish you with Yurtel wristbands. We’ll then offer you a complimentary glass of fizz to help you relax into the Yurtel at Steanbow 2019 vibe. Directions to the camp and to the RVP within the festival will be provided at the time of booking. Yurtel @ Steanbow 2019 is in one of the best possible locations. We’re close to the action but still far enough away for peace & tranquillity. Guests will be driven the short distance from the Yurtel Camp Reception through the Red Gate, past the Wicket Ground to our on-site Rendez Vous Point (RVP) by the festival Hospitality Area - and back again - by our 24hr Transfer Service. It is a short walk from the Yurtel RVP to either of the main stages or to the Hospitality Area located in Interstage, the ideal central jumping off point from which to explore the magic of Glastonbury Festival. Our team will be on hand to help direct you to wherever you wish to wander. 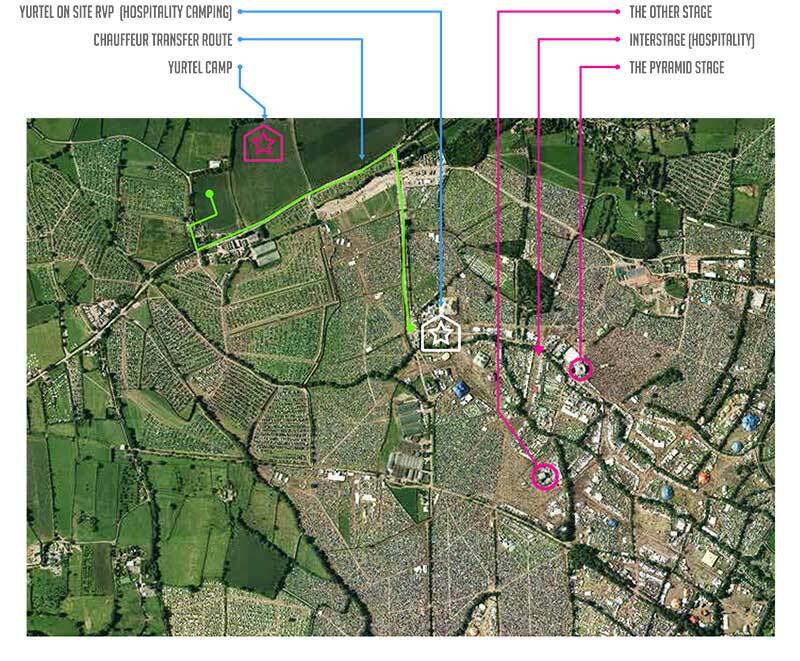 The map on the left shows the key locations to help orientate yourself in relation to the location of the camp and within Glastonbury Festival itself. Yurtel has been delivering the finest accommodation and hospitality solutions to the UK private, corporate and festival event industries for over 12 years. We are based in the South West and are owned and operated by Festival veterans with a deep understanding of first-rate service and a serious knack for the personal touch. Add to this our knowledge of what makes Festivals so special and you have a team honed to deliver the finest possible experience. We are constantly investing in all aspects of our business, be that the Après-Festival Spa (new for 2019), our Luxury Suites (complete with your own loo and wet room!) or our ceaseless quest to present the best food, wine and service available … in the middle of a field! With Yurtel you can be sure that we take your fun very seriously. Hospitality tickets are sold at face value. Hospitality tickets can only be purchased alongside Yurtel structure packages. A hospitality ticket allows you access to the Interstage area which is between the Pyramid and The Other stage. Within Interstage is the official Glastonbury hospitality area which you will be welcome to use throughout the weekend. Please see link below for full festival ticketing information.